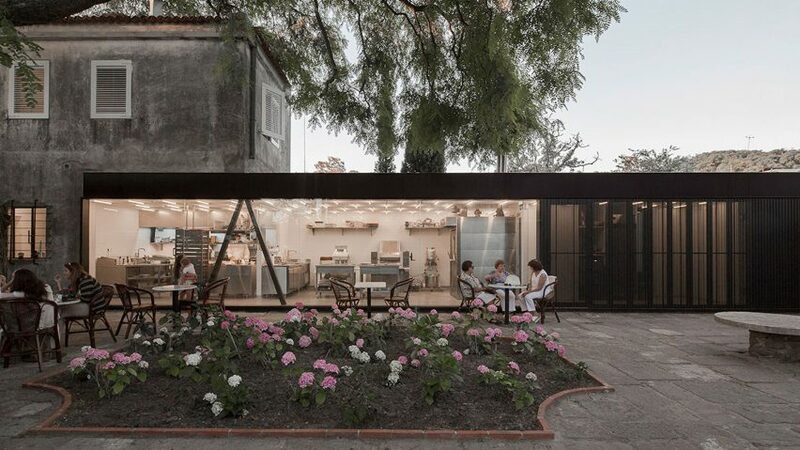 Extending this historic home in the capital of Uruguay has allowed architect Pedro Livni to reconfigure living spaces into a cafe, and place a bakery in the courtyard. 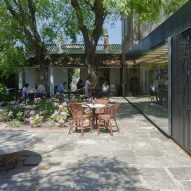 La Linda is an artisanal cafe and bakery built within a 1927 garden house in the country's capital Montevideo. 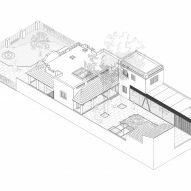 The bakery spaces required did not fit into the original home, so the architect chose to build an extension at the back for these areas. 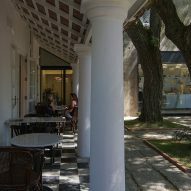 "It was decided to use the house for the public, and incorporate the production area in a new plan extension," said Pedro Livni Arquitecto. 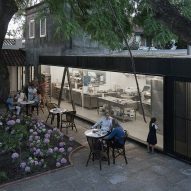 The new bakery is a longitudinal volume that intersects the heritage-listed home. 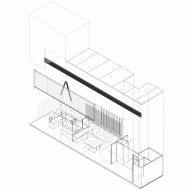 At the point where the structures meet, two angled columns provide additional support, creating an A-shaped outline. 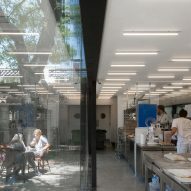 Such a large structural support allowed the architect to make the bakery's walls out of glass, so that customers in the courtyard could observe the food production inside. 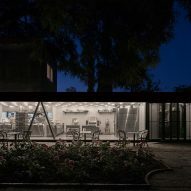 "It allows a total opening to the exterior and makes the production sector, like in a theater, a part of the garden's visual scenery," said Livni. 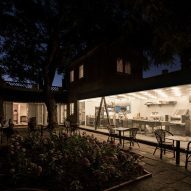 This space has an industrial character, and is lit by a grid of simple neon tube lights. This contrasts the old house nearby, which was preserved as much as possible. 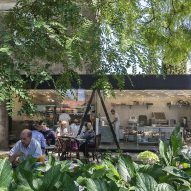 "From a material point of view, the preexisting sectors are restored keeping the original floors and woodwork," explained Livni. 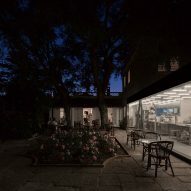 To make the interiors feel more neutral, the architect chose to paint the walls and ceiling white, "as a way of erasing the weight of its previous inhabitation." 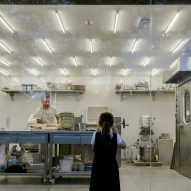 Images of the bakery show a simple chequerboard floor, with details like a marble counter and restored crown mouldings. 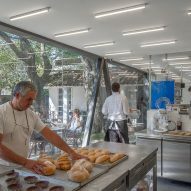 The interiors are generously lit from a series of skylights. 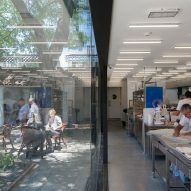 Bakeries have been created in old buildings all over the world, including a London post office and a timber-framed house in Fukuoka. Photography is by Pablo Casals Aguirre.